left-o-ver - 1. Usually, leftover. food remaining at the end of the meal, especially when saved for a later use. 2. anything left or remaining from a larger amount; remainder. It started with leftover biga or bread starter. Since that is a 24 hour process I did not want it to go to waste...so what else is a girl to do? Make more bread of course. We had a little very thinly sliced prosciutto, one apple and some cheddar. A drizzle of olive oil on the top slice and thinly sliced apples on top of the prosciutto and cheese. I'm not one to like a lot of kitchen gadgets, but a panini press is one thing I could not live without. Thanks to my dear friend Eileen who was responsible for getting me a job at William Sonoma it is just one of the many items I purchased while working there. The one I have is made by Breville and it's worth every penny. I agree presses are fantastic, they can turn an average lunch into a cafe lunch! Your idea of left over panini is brilliant - and it looks fantastic! It looks delicious! Williams Sonoma is one of my favorite places to shop. I am sure you enjoyed working there. Oh yummy! That looks so delish! You have me contemplating purchasing a panini press. Thanks for sharing. Leftovers are the foods of the gods! My daughter swears by a panini of green apples and brie. This sandwhich looks amazing! I can't live without my Breville panini press either! I've had it for about 3 years now and use it all the time. WS is one of my favorite places to shop. In fact, I was just there today and did some damage! I am not big on gadgets and have little space top store them...but that sandwich does look delicious. 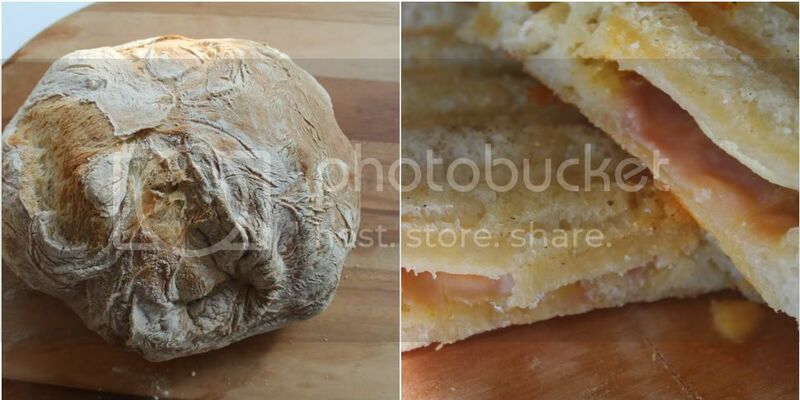 Have you shared this bread recipe before and if so must have I missed it? We rather like leftovers and particularly when they can become something as delicious as you show here. Kitchen gadgets are, in our view too, somewhat overrated. Wow these looks seriously amazing, I’m drooling all over the screen here, I have to tray this ASAP, I bet it taste as good at it looks, it seem simple enough for me to prepare, I will give it a tray! Your have an awesome blog by the way and I am a new follower! Hope you will like my blog and follow back! Annie your quick yummy sandwich looks so tasty, and the apple adds a crunch in ever bite. I too resisted purchasing the panini press... don't wait if you have a teenage son!! I think WS would be such a great place to work at. And with the discounts too, which include Pottery Barn and West Elm correct? I bought my husband a panini maker a few years ago to surprise him at Christmas. (he had been bugging me to buy one) But I'm the one that cooks. :) I was just thinking the other day that it's soup and panini weather again! Thanks Annie! I have been looking for something to put on Santa's list for myself…I love Italian Paninis the very most and ate a TON of them while in Italy. We use our panini press all the time too, so much so that it sits out all the time, which I kind of don't like. We use ours beyond panini making though. We use it to cook raw tortillas or to warm up corn tortillas almost more than we do for sandwiches. This little panini you made looks pretty delish and simple! This looks so good! I love apples and cheese! You've made me really want a panini press too - yum! Looks delicious an better it tastes even better with homemade bread! My favourite meal for breakfast lunch or dinner has to be a toastie sandwich, or if I'm feeling fancy panini. Yum!